JOJUTLA, Mexico—The historic town hall has long been beloved by the people of Jojutla. And the sight of it after the Sept. 19 earthquake — its clock tower toppled, its bells exposed to the sky, huge gaping holes in its brick walls — led many to fear the worst. It was as if the soul of Jojutla, a village in the state of Morelos two hours south of Mexico City, had been fatally wounded. After all, the town hall — built a century and a half ago — is the heart of the tourist experience here. A place that marked the annual Independence Day celebrations with aplomb, filled with singing, mariachi music, food, folkloric dancing, a concert, the crowning of a beauty queen. Just days before the magnitude 7.1 earthquake hit, the town hall was lighted with neon signs in the national green, white and red that said “1810 Viva Mexico 2017,” a reference to the year Mexico declared its independence from Spain. So there was one question that seemed to be on the townspeople’s minds, including one 24-year-old resident, Angel Carlos, who approached a visitor wearing a hard hat and asked: Do you think the building can be saved? It was a question a structural engineer could answer. On Thursday, two of them from California — California seismic safety commissioner Kit Miyamoto and FEMA National Advisory Council member and earthquake engineer Anna Lang — came into Jojutla from Mexico City to find out what they could learn and lend a hand, if needed. Locals welcomed them. They told locals to move cars and people away from certain areas of the building — remaining brick walls from the upper story could still collapse on people below. “No, no, no,” Lang interrupted. “Farther,” she said. The people needed to be held farther back. Then, inside they went, past the grand arches into a darkened hallway of the town hall. “Don’t worry, it won’t fall on us,” Lang said to a colleague. “But I will put my whistle on” — just in case an aftershock hit and they had to call for help. Miyamoto and Lang entered the courtyard — filled with arches and a fountain. “Man, this is a beautiful building,” Miyamoto said. But could they? Just a few yards to the east, entire blocks had buildings that were compromised. 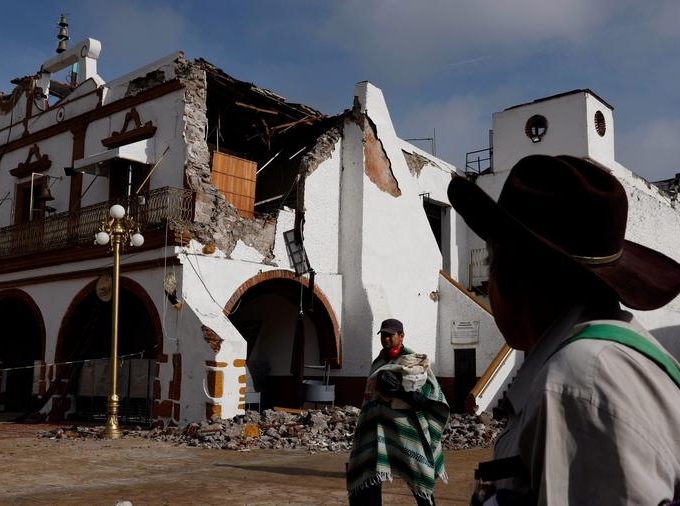 At least 17 people died in Jojutla, including three killed when they ran out of the town hall, only to be crushed by falling bricks that once housed the building’s iconic clock and bells. Miyamoto and Lang looked about and saw, to their trained eyes, promising signs. The ground floor appeared to withstand the shaking well. Later, outside the town hall, they announced the verdict to local officials. “This can be rebuilt,” Miyamoto said. A local historian, Guillermo Mañon Cerrillo, gulped a quick breath. Miyamoto said he has seen officials make rash decisions to tear down a historic building. “They just take everything down. Do not do that,” Miyamoto told a local official. The historian appeared near tears when he heard of the news, Lang said. One dilemma became quickly apparent: Tax and other records — vital to the functioning of the town government — on the second floor needed to be rescued. If officials were to rescue the documents, they needed to do it quickly and with as few people as possible. After discussing the issue with local officials, Miyamoto said it would be easier to just stop talking and haul out the documents themselves along with the town’s firefighters. “Let’s do it,” he said. Lang quickly went into the back storage room, where she pulled down documents from shelves. Miyamoto joined firefighters in hauling down many binders. Carlos, the 24-year-old who lives nearby, was joyful to hear the town hall could be saved. Not all of Jojutla would get good news. A walk through a main street revealed a shattered commercial district. Streetlights were out. Utility poles leaned. Brittle concrete columns burst open, showing broken rocks in the pillar that could not be held by the steel reinforcing bars embedded inside; there just wasn’t enough rebar, configured the right way, to do the job. At one bank, the building’s columns now stood at a leaning angle — far beyond repair. On one side street, an entire building collapsed, showering cars with bricks. Next door was a brittle concrete building with large cracks in two columns. “This is non-salvageable,” Miyamoto said. Another building, a concrete-framed, brick-wall structure, suffered widespread damage in its concrete columns, Miyamoto said. “Do you have earthquake insurance?” Miyamoto asked the owner. “No,” he replied, shaking his head. Hannibal Reyes, 42, a volunteer rescuer from Ensenada, said towns like those in Morelos need help from structural engineers. In the nearby town of Tehuixtla, an emergency command center was filled with supplies, such as bottled water and toilet paper, but some of the buildings hadn’t yet been inspected until Miyamoto and Lang arrived. “There’s places that do have stuff but need technical help,” Reyes said. For others, there was hope. One three-story hospital in Jojutla appeared to have suffered heavy damage, with large portions of brick walls thrown into the street. The building could collapse should an aftershock strike. Yet the building could be salvaged. “I didn’t see any damage in the concrete columns or beams,” Miyamoto said after a quick inspection. At an auto supply store that hadn’t been inspected, concrete columns on one side of the building had telltale diagonal cracks that showed that they were in danger of collapse. Yet by the time he left, Miyamoto said the place could be repaired. “The damage is concentrated in a certain area,” Miyamoto said. “If a replacement happens to those columns, you can repair it.